The main character is a fiery, unconventional young woman. A GIRL is proficient with sword and bow. Both my daughter and I were riveted by the previews. One of the things I love about science fiction is that it’s one of the first genres to open up to the idea of the warrior woman. In fantasy, warrior women were six foot Amazons of the type parodied by Jim Carey in the old TV show “In Living Color.” Science fiction opened the door to smart, savvy women who can outfight, outfly, and outshoot any average man, while still hanging on to her femininity. As a petite woman myself with a sword and a shoe weakness, that is what I liked about Merida. The fiery-haired young princess, much to her mother’s annoyance, would prefer to be flying across the countryside on her trusty horse “Angus,” rather than learning comportment and manners and other “useless” skills. Both my daughter and I (each with older brothers to keep up with) can relate to Merida’s lament. The boys got to have all the fun and excitement, while my mother expected me to “be a lady.” Being demure, calm and ladylike was never in my nature. In my rambunctious household, the only way to respond to being pushed was to push back harder. The only way to be heard over the noise was to get louder. The only way to get what I wanted was to go after it myself. I felt like an utter failure my entire childhood until, like Merida, I rebelled. My little girl is very like Merida…and me. She would rather plan her future as a Pink Ninja, saving the world with a sword in one hand, a ray gun in the other. She’d like to look chic and girly while doing it, so she’ll wear pink body armor, thank-you-very-much. I love that Disney has finally given me a princess that I can relate to. Over the decades, Disney’s princesses have gone from being hand-wringing victims, sweet and helpless, waiting for Prince Charming to show up and rescue her from the evil machinations of those who would do her harm, to the fiery and independent young woman who is willing to defy her mother and fight for the right to choose her own fate, with bow and arrow if need be. Merida is the first Disney princess I really would like to see my daughter want to emulate. Like many independent-minded, unconventional young ladies, Merida brings her problems on herself. However, she also quickly realizes what she’s done and she sets out with the same single-minded determination to put things right… on her own. In the process, Merida learns that some of the lessons her mother had been trying so hard to impart are, in fact, quite important and useful. 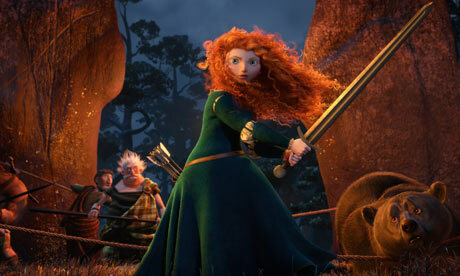 Once Merida is able to tame her own independent streak, she redefines her priorities and makes amends with her mother. Once the two women, more alike than not, stop trying to force their own way on the other, each finds a new respect for the other. Merida proves herself the essence of the woman her mother wants her to be, but on her own terms. For a firebrand with a fiercely independent streak, facing life on your own terms with the support of your loved ones is what it’s all about. 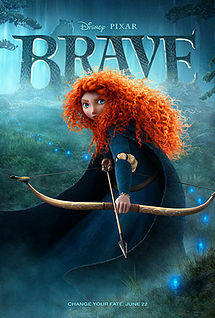 To my daughter, Brave is a fun movie that she thoroughly enjoyed as she watched from her Mama’s lap, snuggling and cuddling through the scary parts and dancing and waving her imaginary sword during the swashbuckling bits. When it comes out on DVD, she’ll watch it endlessly. I wonder if she’ll want a Merida costume for Halloween this year.